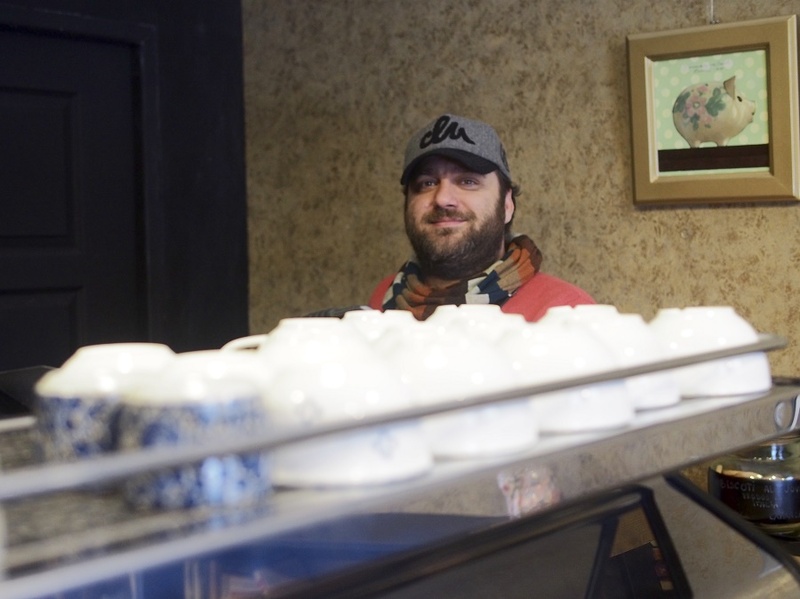 Smaranda Milu Némethi and her husband Dan Milu, photographer now turned barista, have recently opened a cafe downtown Bucharest, behind Cocor shopping center. Smaranda is fighting stage 4 of a rare form of cancer and the cafe is meant to help fund her treatment. It’s beginning of January, 2017, and the heavy snow has paralyzed Bucharest. But if you just watch the snowflakes from inside the cafe, the city looks beautiful. It’s like one of those glass balls with snowflakes inside. Smaranda is wearing a white sweater and a vest, sipping from a cappuccino and brainstorming for some Valentine’s ideas. She and Dan opened the cafe four weeks ago and are looking for ways to promote it. They want to organize a photo shoot for couples on Valentine’s day. Photographer-turned-barista Dan is behind the counter making a coffee for a customer who just arrived. Their relationship took many turns along the years. Smaranda and Dan met while she was working as an art director and he was a photographer. They clicked immediately and became best friends. Then love kicked in, they gave in and finally got married, opened a creative agency together. At the end of 2013, Smaranda was diagnosed with cancer. It turned out to be a rare form of cancer, a mutation. The good news was that there was treatment available for this mutation. However, the drugs are very expensive. In June last year, Smaranda and Dan realized that they were running out of money. In her case, money is not just a whim, but a matter of surviving. So, they had to come up with a good idea that would secure them a constant income. “We are both obsessed with coffee, so we said let’s open a cafe,” says Smaranda laughing. With courage and out of necessity, Smaranda and Dan became business partners in their new project: Milu Cafe. The couple had been looking for a space to rent for months, but couldn’t find anything suitable. It was either too expensive or it was available only some months later. One day they were returning to Smaranda’s studio in the Unirii area, where she had painted her “Little Things” collection. They were disappointed and tired. It was then when they saw a small space, very close to her workshop. A beauty saloon had been there, but it didn’t work and the owners were just clearing the space. Smaranda and Dan enquired about the rent and the availability. By November they signed the contract, and one month later they opened the cafe. It was December 16, 2016. Everything was great about the space, except for one little detail: the golden wallpaper. Smaranda thought it looked a little bit kitschy. However, they didn’t have enough money to refurbish the whole space. She thought for a while what she could do about it, and then she did what she knew best. She looked at the whole story from a different perspective. From one side, it could inspire a slightly kitsch decor. But then a golden wallpaper has its nostalgic beauty, like all those details that decorated our parents’ houses: china figurines, “Persian” rugs (which of course weren’t real Persian rugs), old clocks. It was aesthetics transformed under the weight of time. “Let’s do something else, if all cafes (in Bucharest) have this Nordic design, distant and cold. Let’s do something like in good old times. Little things. They all bring you the past,” says Smaranda. She played against the trend. 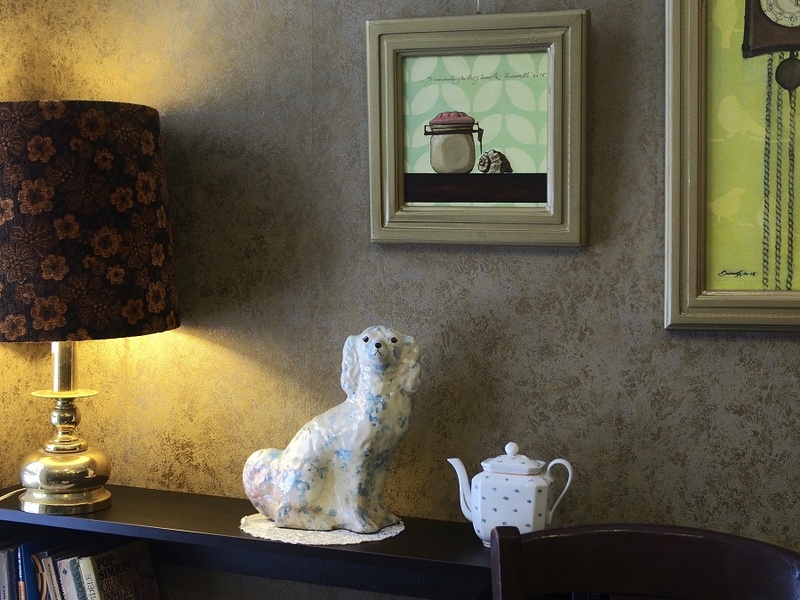 While many cafe owners in Bucharest follow a minimalistic style, Smaranda bought a lot of old decorative objects, like a mottled porcelain dog, and a lot of books. Besides that, she made the design for the furniture and the bar, which was produced in a workshop in Carei, her hometown. The grinder was ordered from the US. Dan Ioan Milu is wearing a dark blue apron and a name tag with Milu Dan Barista. It’s a warm evening, beginning of April. He is making coffee, observing his customers. Although he’s a bit tired, the bearded man still keeps the friendliest smile. Starting the work in the cafe early in the morning every day of the week is not easy, but he doesn’t complain. Right now, he’s on a mission. Make good coffee, keep the customers satisfied, have them come back. Things have started to roll for Smaranda and Dan, as more and more people have found out about the cafe. There is some anxiety once in a while, about whether the project will be sustainable on the long term, but as Smaranda puts it, the two take turn in being worried. When one of them jumps into the rollercoaster of worries, the other one is there to be strong, and vice versa. And not only for the cafe. Their life is made of several challenges. But despite everything that comes and goes, there is an inexhaustible joy of life they share. “A shot of espresso?” Dan asks a new customer coming in.